If you have any questions or want to enquire about dates, use our form to contact Maria Cruz Totorika & Graeme Hobbs or see their website for more information. Who would guess this bucolic spot was an hour from Santander, Bilbao and the beaches of Laredo? 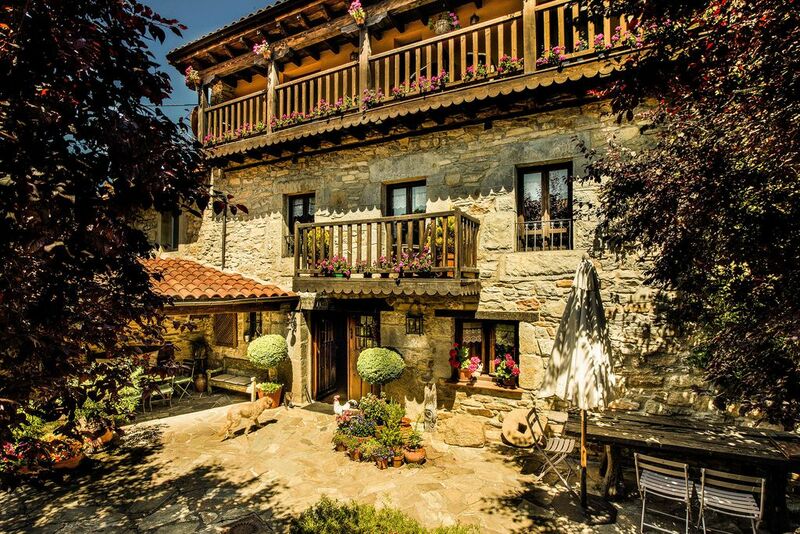 In a farming village in time-forgotten Burgos, Casa Zalama is a place to seek out: linger as long as you can. English Graeme and Maria from the Basque country uprooted from Brighton and now are living the dream. Maria’s lovely furnishings are matched by rustic stone walls and big chunky beams, bedrooms have comfortable beds and earthy colours, and, some, balconies with views of the hills. As for the garden, it’s a feast for the eyes, beautifully tended yet half-wild, alive with Graeme’s wooden masks and stone sculptures; soak up the peace, drift off in the hammock. Dinners are served in the atmospheric old stables, and the food is country Spanish and delicious: local sausage, home-grown vegetables, pear tart. Opposite the house is a colourful self-catering cottage, a cosy retreat for a couple or a small family. The birdwatching is brilliant, the countryside a dream, and creative workshops are planned; Graeme works with wood, Maria with felt and their energy and generosity is contagious. What value. Minimum stay: 3 nights in high season. Pets by arrangement. What a lovely place! Graeme and Maria were great hosts and made us feel very welcome. Great house and beautiful garden. Fantastic home cooked meal every evening. We were passing through on a tour of northern Spain. Maria's recommended routes for the days we were there provided some of the most beautiful scenery of the whole holiday. We wished we could have stayed longer. Hope to return. Estupendo! Super casa, super hosts and super food. Maria and Graeme could not have been more welcoming. They very kindly allowed me to bring my retrievers, which enabled me to attend a local dog show in September and again, in November on route back from Portugal. Thank you both so much. I highly recommend this special place to stay! What a wonderful Casa Rural!! We were fortunate to have Casa Zalama recommended to us and decided to come for a stay as it looked so nice on the Sawday's website aswell. Thank goodness we did as we discovered a Spanish rural heaven! Graham and Mari-Cruz are fantastic people and we felt like old friends at the end of our 2 night stay. The food is wonderful - don't go anywhere else. And to sit and eat in the cosy diningroom with the fire crackling in the back ground is just bliss. Do ask Graham to put his "special" music on! If in Northers Spain - stay here! We will absolutely be back! Loved the house - very comfortable accommodation with fantastic food. Our hosts were very friendly and helpful and really made us feel at home. A bit off the beaten track but well worth a visit. We would definitely go back, if only for more of Marie-Cruz's cooking! Ojo Guareña Natural Park, a beautiful cave system, the longest in Europe with over a 100km and the enchanting San Bernabe hermitage carved into the rocks. Zalama Mountain, fantastic walk from the house in San Pelayo, to enjoy fantastic views of the valley, you can horse riding also from the village. Frias, Puentedey, Valle de Mena, Medina de Pomar are some of the many places you can visit around us, offering you fantastic walks, waterfalls, Romanesques Churches and very interesting natural beauty. Ebro Canyon offers a stunning walking route following the river and surrounded by very impressive villages to visit like Orbaneja del Castillo selected as one of the most beautiful villages in Spain. Santiago Natural Park, very spectacular area with enjoyable walks through a beech forest with the tallest waterfall in Spain. Bilbao with the Gugemheim Museum, Burgos with it magnificent Catedral and Santander with a stunning coast line and beautiful beaches are an hours drive from the house.